" Sequoia E-Voting Machines Reporting Inaccurate Totals in New Jersey	"
As Union County Clerk Joanne Rajoppi tried to verify returns in this month's historic presidential primary, she kept coming up with errors for a handful of voting machines. The numbers from the cartridges that print out vote tallies and the paper-tape backup within the machine didn't match. Rajoppi asked her colleagues in other counties to perform the same test, and similar problems were found in voting machines for Bergen, Gloucester, Middlesex and Ocean counties. Problems with Sequoia's AVC Advantage systems also emerged early on the morning of Super Tuesday, forcing a 45 minute delay for the state's Governor, who was unable to cast his vote when the machines failed to boot up on Election Day. In February of last year, the same machines were hacked by a Princeton University Professor after he'd been able to purchase a number of the $8000 systems for just $86 apiece on the Internet. The errors involve voter-turnout totals. For example, both the tape and cartridge on one machine in Cranford show 225 votes were cast when Democrat and Republican votes are added. The problem is, the tape and cartridge don't agree when the numbers are broken down by party, Rajoppi said. The tape counts 168 votes for Democratic candidates, while the cartridge shows 170. On the Republican side, the tape counts 57 votes, but the cartridge shows 55. "Initially, when I called Sequoia they said it was an anomaly. And I said, 'Excuse me. It's not. It's an error,'" Rajoppi said. Congratulations to Rajoppi for making that important distinction. These are not anomalies, glitches, snags, snafus or hiccups, they are failures by these expensive products and/or voting machine companies to perform as expected and well-paid. Sequoia's spokeswoman, Michelle Shafer, says that the company is working with election officials to determine the cause of the problem. The Associated Press reports that a Sequoia technician has blamed the problem on a corrupted computer chip. That seems to be a stretch in logic because it would mean that chips failed in five counties that have all reported the same problem, and they all failed at the same time. The BRAD BLOG previously reported problems on the same voting machines early on the morning of Super Tuesday in New Jersey, when the Advantage machines failed to properly start up, resulting in embarrassment when NJ's Gov. John Corzine was forced to wait 45 minutes before he was able to cast his vote. Reports of votes flipping from Hillary Clinton to Barack Obama were also reported that morning. In February of 2007, we reportedon the same Sequoia Advantage machines having been hacked in five minutes by a professor at Princeton University, who had purchased five of the machines on the Internet from an on-line government equipment clearinghouse for $86 apiece. The same systems were recently purchased by the state of New Jersey for $8,000 each. "We can take a version of Sequoia's software program and modify it to do something different --- like appear to count votes, but really move them from one candidate to another," Princeton computer science professor Andrew Appel told the New Jersey Star-Ledger at the time. "And it can be programmed to do that only on Tuesdays in November, and at any other time. You can't detect it," he said. At the time, an Election Integrity group had filed a lawsuit against the state, claiming the 10,000 AVC Advantage machines were in violation of state law since they were never properly certified as secure or reliable, as required by the state. "There is zero documentation --- no proof whatsoever --- that any state official has ever reviewed Sequoia machines," Attorney Penny Venetis, co-director of the Rutgers Constitutional Litigation Clinic, argued at the time. "This means you cannot use them...These machines are being used to count most of the votes in the state without being tested in any way, shape or form." "Had the machines been tested," the state Election Integrity advocates found, "they would have proved to be a hacker's dream." 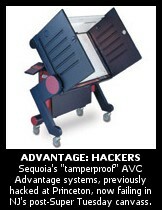 Sequoia Voting Systems responded to the reports at the time by claiming their election products were "tamper proof." Independent studies commissioned recently by the states of California, Ohio and Colorado have all found otherwise, as the testers were reportedly able to violate the security measures on Sequoia's DRE systems in a matter of seconds. « PREVIOUS STORY "Diebold Names Senior Diebold Officials to 'New Independent' Diebold Election Division Board"
"Sequoia E-Voting Machines Reporting Inaccurate Totals in New Jersey"
In February of last year, the same machines were hacked by a Princeton University Professor after he'd been able to purchased a number of the $8000 systems for just $86 apiece on the Internet. I can hear kos and diebold saying "you get what you pay for" no matter what you pay. And how long did it take to make the papers? I keep coming in from watching the lunar eclipse in my backyard, and I keep remembering that C. Columbus as commander in chief of the good ship lollypop he was on, told the natives that he was going to steal the moon if they did not do thus and such. He was aware of "scheduled" terror alert color raises eclipses and also of the native superstition about the moon. Well the natives were, in spirit, Senate democratic types and so they capitulated ... and gave him the provisions ... whatever you want Mr. Bush Columbus. Maybe you will end up needing U.N. observers in the next election in good ole USA in November. New Jersey has always had a 'reputation' that wasn't consistent with 'law and order'. Old-skool Dutch hacker embarrasses officialdom and and electronic voting machine lease/provider by hacking into the e-voting machines. The e-voting machines have been quietly removed and the vote will once again be recorded on paper. The regulations treated these systems as if they were indeed mere 'machines': they worried about the amounts of humidity and vibration they could withstand and they made sure nobody would get shocked from touching one. Computer security wasn't even mentioned. But the biggest problem wasn't the lack of security, it was the lack of transparency. We got together a small group of like-minded people and started planning a campaign. There had been previous attempts to raise the question trustworthiness in relation to voting machines, but the ministry of the interior was used to painting the opponents of electronic voting as technophobe luddites. Given that half our group consisted of hi-tech-loving hackers this was an approach that wasn't going to work this time. We claimed that the Nedap 'machines' were computers and not 'dedicated hardware' (as the manufacturer claimed) and that they could just as easily be taught to play chess or lie about election results. The person selling these computers in the Netherlands wrote wonderful long rants on his website, and in reaction to our claim he said he did not believe his 'machines' could play chess. So we caused a true media frenzy when we got hold of a Nedap voting computer and made it play chess. (We also made it lie about election results.) There was a debate in parliament, during which the responsible minister promised to appoint two committees. That next election, an international election observation mission studied the problems with electronic voting in the country which until then had always been the example country for uncontroversial e-Voting. In their report, they advised that this type of voting computers "should be phased out" and the two committees also wrote very harsh reports about how these 'machines' came about and how they should not be used in the future. I had the same problem the Governor had when I voted in Bergen County. The poll workers couldn't get the voting machines - ES&S - to boot. They did better than in Hoboken, because they got them up and running in about 15 minutes. Still don't know how or if my vote counted. We programmers call these bugs "undocumented features". Say it ain't so?!?! I thought these voting machines were perfect. How could a computer possibly make a mistake? Thanks to the major vote in the Supreme Court of 2000 in Bush v. Gore, Slavery is alive and well in America by means of the Electoral College. re: Voting Machines and their unreliability. WE MUST GO BACK TO PAPER BALLOTS, HAND COUNTED !! !